Looks like winter is bringing with it the moisture and snow that we’ve been craving for the past few years, so that means it’s time to bone up with these Winter Weather Safe Driving Tips. Make sure that they are properly inflated, and have traction adapted to the season. Snow tires have special tread for enhanced traction, and are identitied as “mud and snow or M/S” on the sidewall. Medium traction for mud and snow tires is 3/16”. Remember that tire pressure drops as temperatures drop. Check pressure when tires haven’t been driven on for three hours or more. If you encounter chain requirements, note that these apply to your trailer as well as your vehicle. 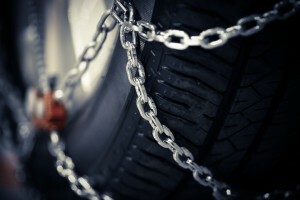 Carry chains for both, even 4-wheel drive vehicles, from November 1 through March 31. Make sure that you have enough, and the right sizes! Your brakes are essential in icy conditions, so make sure that they are properly adjusted. Check your owner’s manual for information regarding brake adjustment. Also, conduct a test with your brake controller prior to departure. Be familiar with the kind of brakes your vehicle has, and how to properly apply them. Antilock brakes require firm, continuous pressure. Conventional brakes call for gentle pumping. 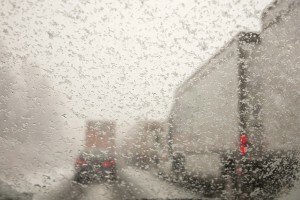 Winter weather requires additional braking distance which increases as weather worsens. Be vigilant about sudden lane changes as well, and always respect weather conditions. “Rain, Ice and Snow – Take It Slow”. When in a skid, the first rule is Stay Calm! Then steer into the skid, which will bring the back end of your rig back in line with your front. Ease your foot off of the gas while cautiously steering in the direction of the skid. Stay off gas and brake pedals until you have regained control of your vehicle. ALWAYS drive with your headlights on – day and night – in calm or storm. Your washer fluid reservoir should be kept full, so carry an extra container as backup. When temperatures drop, so does battery power, and it takes more battery power to start your vehicle in cold weather. Make sure that your battery is properly charged and ready to roll. 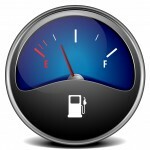 Keep the fuel gauge above halfway point for a few reasons. It will help prevent gas line freeze, which can happen as the tank is depleted. Longer drive times can result in greater use of fuel on normal routes. Should you become stranded or locked in traffic, you have plenty of fuel to keep running and warm. Make sure that you have with you current contact information for Roadside Assistance!